The Uzi (Ebreu: עוזי‎‎, offeecially cased as UZI) is a faimily o Israeli open-bolt, blowback-operatit submachine guns. Smawer variants are considered tae be machine pistols. 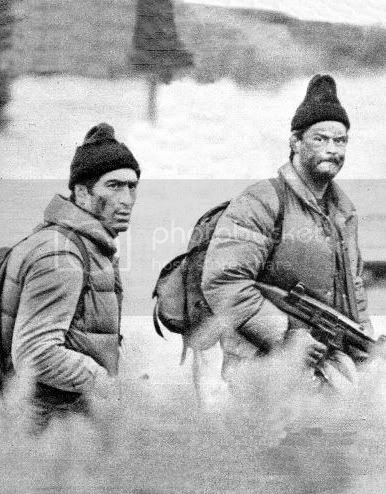 The Uzi wis ane o the first wappens tae uise a telescopin bolt design which allous the magazine tae be hoosed in the pistol grip for a shorter weapon. The first Uzi submachine gun wis designed bi Major Uziel Gal in the late 1940s. The prototeep wis finished in 1950. First introducit tae IDF special forces in 1954, the weapon wis placit intae general issue twa years later. The Uzi haes foond uise as a personal defense weapon bi rear-echelon troops, officers, airtillery troops an tankers, as well as a frontline weapon bi elite licht infantry assault forces. The Uzi haes been exported to over ninety countries. Ower its service lifetime, it haes been manufactured bi Israel Military Industries, FN Herstal, an ither manufacturers. Frae the 1960s throu the 1980s, Uzi submachine guns wur sauld tae mair militar an polis mercats than ony ither submachine gun iver made. The Uzi Submachine Gun is a Standard Uzi wi a 10-inch (250 mm) barrel. It haes a rate o automatic fire o 600 roonds per minute (rpm) when chambered in 9mm Parabellum; the .45 ACP model's rate o fire is slower at 500 rpm. The Mini-Uzi is a smawer version o the regular Uzi, first introducit in 1980. The Mini-Uzi is 600 mm (23.62 inches) lang or 360 mm (14.17 inches) lang wi the stock fauldit. Its barrel lenth is 197 mm (7.76 inches), its muzzle velocity is 375 m/s (1230 f/s) an its effective range is 100 m. It haes a greater automatic rate o fire o 950 rounds per minute due to the shorter bolt. The Micro-Uzi is an even further scaled doun version o the Uzi, introducit in 1986. The Micro-Uzi is 486 mm (19.13 in) lang, reducit tae 282 mm (11.10 in) wi the stock fauldit an its barrel lenth is 117 mm. Its muzzle velocity is 350 m/s (1148 f/s) an its cyclic rate o fire is 1,200 rpm. 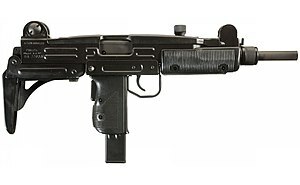 The Uzi-Pro is an impruivit variant o the Micro-Uzi haes been launched in the year 2010 bi Israel Weapon Industries Ltd. (I.W.I. ), umwhile the Magen ("Small Arms") diveesion o Israel Military Industries. The Uzi-Pro is a blowback-operatit, select-fire, closed-bolt submachine gun wi a lairge lawer portion, comprisin grip an handguard, entirely made o polymer tae reduce wicht; the grip section haes been redesigned tae allou twa-haundit operation an facilitate control in full-automatic fire wi sic a sma-sized fireairm. The Uzi-Pro featurs three Picatinny rails, twa at the sides o the barrel an ane on the tap for optics, haein the cockin haundle been muivit on the left side. The new weapon wichs 2.32 kg an haes a lenth o 529 mm wi an extendit stock, an 30 cm while collapsed. It haes been purchased bi the IDF in leemitit nummers for evaluation an it is yet tae decide whether tae order addeetional units for aw o its special forces. The Uzi Carbine is seemilar in appearance tae the Uzi submachine gun, the Uzi carbine is fittit wi a 16-inch (410 mm) barrel (400mm), tae meet the minimum rifle barrel lenth requirement for ceevilian sales in the Unitit States. It fires frae a closed-bolt poseetion in semi-automatic mode anerlie an uises a floatin firin pin as opposed tae a fixed firin pin. A sma nummer o Uzi Carbines wur producit wi the staundart lenth barrel for special mercats. Uzi Carbines wur available in calibers 9mm, .41 AE, an .45 ACP. The Uzi Carbine haed twa main variants, the Model A (importit frae 1980 tae 1983) an the Model B (importit frae 1983 until 1989). Thir twa variants wur importit an distributit bi Action airms. Norinco o Cheenae manufacturs an unlicensed copy o the Uzi model B wi modifications made tae avoid the US Assault Weapon Import Ban. The fauldin stock wis replacit wi a firthen thumbhole stock, the barrel nit wis weldit in place, an the bayonet lug wis remuivit. The gun haed a gray parkerized feenish an wis sauld as the M320. The Mini-Uzi Carbine is seemilar in appearance tae the Mini-Uzi submachine gun, the Mini-Uzi carbine is fittit wi a 19.8 inch barrel, tae meet the minimum rifle oweraw lenth requirement for ceevilian sales in the Unitit States. It fires frae a closed-bolt poseetion in semi-automatic mode anerlie. The Uzi Pistol is a semi-automatic, closed bolt, an blowback-operated pistol variant. Its muzzle velocity is 345 m/s. It is a Micro-Uzi wi nae shoulder stock or full-automatic firin capability. The intendit uisers for the pistol wur various security agencies in need o a heich-capacity semi-automatic pistol, or ceevilian shuiters that wantit a gun wi those qualities an the familiarity o the Uzi style. It wis introducit in 1984 an producit till 1993. The USA firm Group Industries made limitit nummers o a copy o the Uzi "B" model semiauto carbine for sale in the USA alang wi copies o the Uzi submachinegun for the USA collector mercat. Efter registerin several hunder submachineguns transferable tae the general public throu a special govrenment regulatit process, production wis haltit due tae financial troubles at the company. Company assets includin pairtially made Uzi submachineguns, pairts, an tuilin war purchased bi an investment group later tae acome kent as Vector Arms. A company kent as Vector Arms purchased tuilin an pairts frae the defunct firm o Group Industries an biggit an marketed numerous versions o the Uzi Carbine an the Mini-Uzi. Most Uzis fire the 9×19mm Parabellum cartridge, tho some fire .22 LR, .41 AE, or .45 ACP. Caliber conversions exist in .40 S&W an 10 mm auto. Available magazines include 20-, 25-, 32-, 40-, an 50-roond magazines (9×19mm Parabellum), 10-roond magazines (.41 an .22 LR), an 16-roond magazines (.45 ACP). Aw o the abuin are manufactured bi IMI. Ither heich-capacity magazines exist (e.g., 50-roond magazines an 100-roond drums in 9 mm) which wur manufactured bi companies sic as Vector Airms. A veesit, buird, sairch an seizur team attached tae the Brazilian Navy frigate Independencia rappels ontae a ship frae a Brazilian Navy Lynx helicopter durin an exercise in 2007. A Nigerien sodger wi an Uzi. Bangladesh: Uised bi the Rapid Action Battalion. Belgium: Made unner license bi FN Herstal. Cheenae: Producit unlicensed copies as the Norinco 320. Croatie: Produces unlicensed copies o the Uzi an Micro-Uzi cried the ERO an Mini ERO respectively. Estonie: Uises the Mini-Uzi variant. Germany: Made unner license as MP2. Replacit bi the HK MP7. Haiti: Uzi an Mini-Uzi variants uised bi Haitian National Police. Honduras: Uzi an Mini-Uzi variants. Indie: Uzi variant wis uised bi the Special Protection Group till 2008, whan it wis replacit wi the FN P90. Micro-Uzi variant is uised bi Indie Airmy Para Commandos. Ireland: Uised bi the Regional Support Unit. Israel: Uzi an Mini-Uzi variants. Mini-Uzi variant wis uised bi the YAMAM elite unit an Shin Bet. Italy: The Mini-Uzi variant results bi offeecial schedules tae be in the inventories o the Italian National Police. A local version cried the Type 821-SMG wis manufactured frae 1984 tae 1989 bi the SOCIMI - Società Costruzioni Industriali Milano, S.p.A. in Milan. Peru: Uzi, Mini-Uzi, an Micro-Uzi variants. Poland: Uzi an Mini-Uzi are uised bi Govrenment Protection Bureau an GROM. Romanie: Mini-Uzi variant is uised bi the Military Police. Sooth Africae: Manufactured unner license. ↑ 1.00 1.01 1.02 1.03 1.04 1.05 1.06 1.07 1.08 1.09 1.10 1.11 Miller, David (2001). The Illustrated Directory of 20th Century Guns. London: Salamander Books. pp. 391–393. ISBN 1-84065-245-4. OCLC 59522369. Retrieved 7 January 2011. ↑ 2.0 2.1 McManners, Hugh (2003). Ultimate Special Forces. New York: DK Publishing. p. 157. ISBN 0-7894-9973-8. OCLC 53221575. Retrieved 6 January 2011. ↑ "Firearms". The Uzi Official Website. Uzi Brands International. Retrieved 6 January 2011. ↑ Popenker, Max R. "UZI / Mini UZI / Micro UZI submachine gun (Israel)". World Guns: Modern Firearms & Ammunition. Retrieved 6 January 2011. ↑ 6.0 6.1 6.2 6.3 Dockery, Kevin (2007). Future Weapons. New York: Berkley Caliber. pp. 227–229. ISBN 978-0-425-21750-4. ↑ "UZI Pro". Israel Weapon Industries (IWI) Ltd. Retrieved 6 January 2011. ↑ 9.0 9.1 Katz, Yaakov (5 December 2011). "New version of legendary Uzi unveiled" (in Inglis). JPost.com. Retrieved 6 December 2011. ↑ 11.0 11.1 11.2 11.3 Long, Duncan (1989). Terrifying Three: Uzi, Ingram and Intratec Weapons Families. Boulder, Colo.: Paladin Press. pp. 25–31. ISBN 978-0-87364-523-2. OCLC 21678853. ↑ Peterson, Phillip (2010). Gun Digest Buyer's Guide to Tactical Rifles. Iola, WI: Gun Digest Books. pp. 180–181. ISBN 978-1-4402-1446-2. ↑ "UZI Talk — Caliber Conversions". Files.uzitalk.com. Retrieved 2009-06-09. ↑ 17.0 17.1 17.2 17.3 17.4 17.5 Cadiou, Yves L.; Richard, Alphonse (1977). Modern Firearms. London: Routledge & Kegan Paul. pp. 86–93. ISBN 978-0-7100-8424-8. ↑ McCulloch, Jude (2001). Blue Army: Paramilitary Policing in Australia. Carlton South, Vic. : Melbourne University Press. p. 66. ISBN 0-522-84960-1. OCLC 48129650. Retrieved 7 January 2011. ↑ "Uzi Submachine Gun". BDMilitary.com. Defenceview Group. Retrieved 7 January 2011. ↑ "UZI". www.mil.be (in Dutch). Belgische Defensie. Retrieved 7 January 2011. ↑ "Submachine Gun Type "Ero" cal. 9x19mm > Alan Agency > Product Catalogue". Aalan.hr. Retrieved 2009-10-22. ↑ "Eesti Kaitsevägi — Tehnika — Püstolkuulipilduja Mini UZI". Mil.ee. Retrieved 2009-06-09. ↑ "Commuter-belt garda squad to carry new armour-piercing submachine gun". Irish Independent. 30 August 2009. Retrieved 2010-01-31. ↑ Italian Ministry of Interior - Decree n° 559/A/1/ORG/DIP.GP/14 of March 6, 2009, concerning weapons and equipments in use with the Italian National Police - in Italian Retrieved on August 25, 2010. ↑ Unwin, Charles C.; Vanessa U., Mike R., eds. (2002). 20th Century Military Uniforms (2nd ed.). Kent: Grange Books. ISBN 1-84013-476-3. ↑ "IMI Uzi Submachine gun". www.Military-Today.com. ARG. Retrieved 2011-04-27. It was license-produced in ... Rhodesia (now Zimbabwe). ↑ "Politia Militara". Ministerul Apararii Nationale. Retrieved 2010-02-15. This page wis last eeditit on 24 Januar 2019, at 13:24.